Born in Italy, I came to Minnesota when I was 8 months old. As long as I could remember, I’ve always loved horses. I grew up in the city and the closest thing to having a horse was to draw them. My career as an artist started similar to many, with drawing on the walls of my bedroom at the age of 2. At the age of 16, I received my 1st real commission. Charlie was a thoroughbred race horse owner and wanted me to draw a picture of his horse after seeing me doodling my horses while I was at work. This kicked my career off. Before I knew it, there were many horse trainers, breeders and owners, contacting me about drawing their horse, too. What a great part time job to have while I was in school. Once I got out of college and was working in the “real” world, (real meaning what people expect you to do), I gave up my art to work in the world of business. Once again, someone saw me doodling at work, and again I was pulled back into drawing horse portraits. I always looked forward to my next portrait, as I had so much fun with each one. Searching for an art school was harder than I thought. I serendipitously met artist Jeffrey Larson at Kelley Gallery. He told me about the prestigious school he attended in Minneapolis, Atelier Lack (Now, the Atelier Studio Program of Fine Art.) I called that very day to register for part time classes. I knew the moment I walked into the school that this was what I had been waiting for. I completed the 5 year full time program in 2009. 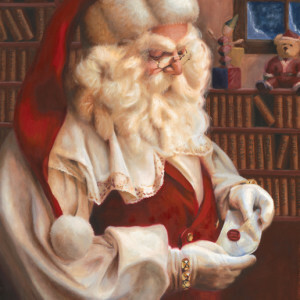 In 2005, I painted the very well known portrait of Santa in Hudson, WI, which Kelley Galleries made prints of. In the summer of 2006, I started horse portraits again, now in oil. Who would have ever thought a little girl who was drawing horses on her bedroom wall would have turned into a full time career as an artist? What more could a little girl ask for?